This listing is for a "Mr & Mrs" set. 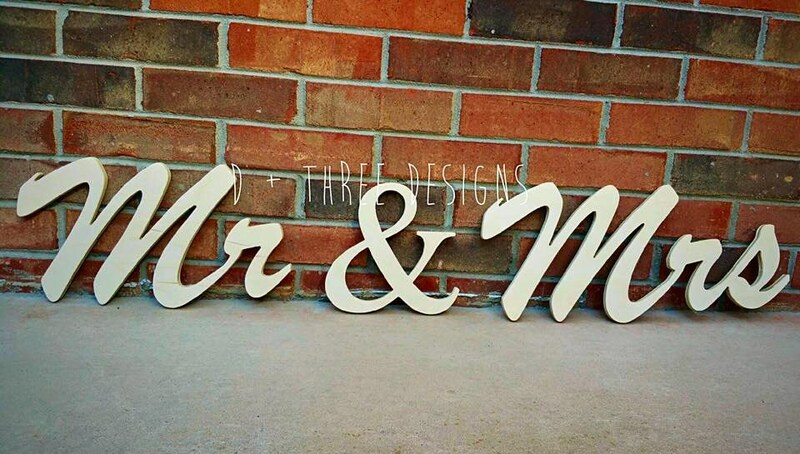 The ampersand is in the same font as the Mr and Mrs. This is great for the bride and grooms table, reception tables, wedding cake table, or just to put on a shelf. The set is made of 1/2" birch wood, unpainted, and comes lightly sanded. Additional sanding is recommended prior to painting. You can stand them up on the table or glue ribbon to the back for hanging! Looks great. Shipped fast. I even has some reservations about the size at first but the owner was so easy to contact and communicate with. I would definitely order again. Item not as sturdy as I'd hoped. I had to put wood on the bottom so they'll be standing up on the head table.